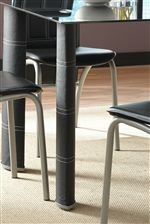 Designed with an extended chair back and sloped metal legs, this side chair has a unique silhouette. 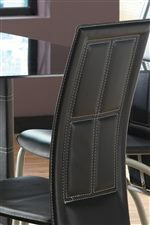 Leather-like upholstery with panel detail and contrast stitching gives the chair a sophisticated contemporary look. 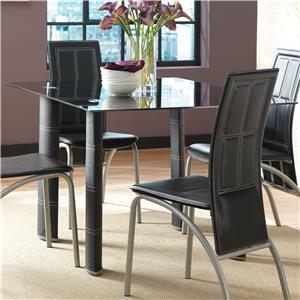 Pair with a glass table for sleek, modern dining. The Calvin Upholstered Side Chair with Extended Back at Morris Home in the Dayton, Cincinnati, Columbus, Ohio, Northern Kentucky area. Product availability may vary. Contact us for the most current availability on this product. The Calvin collection is a great option if you are looking for Contemporary furniture in the Dayton, Cincinnati, Columbus, Ohio, Northern Kentucky area. Browse other items in the Calvin collection from Morris Home in the Dayton, Cincinnati, Columbus, Ohio, Northern Kentucky area.